Au is lying on top of my Beetle. He is sunbathing in the mid morning sun. I wouldn't be surprised if we were living in the cooler bits of Europe or North America, but when you live in Malaysia, a mere hip-skip-and-jump from the equator, it seems to make no sense. We've got boiling hot days where you turn beetroot red from walking about without suntan lotion for just 20 minutes. Yet Au is out there in his fur coat, soaking up the rays. When he comes in, he's toasty hot. I thought until recently our senior cat just had a screw loose. But apparently cats have a problem synthesising Vitamin D. It seems that their fur blocks sunlight, the stuff needed to turn this vitamin into the stuff that gives you strong bones and healthy teeth. So obviously Au is far brighter than I give him credit for. He isn't simply lounging about, he's taking care of his health! Happy Cats On Tuesday! 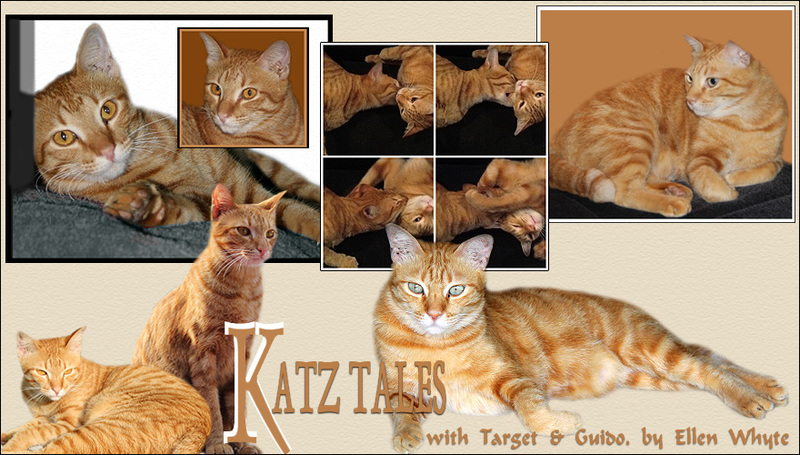 For more cats, visit Gattina or check the blog roll on the left. If you're in Malaysia, check out the Weekender section of The Star on Saturday and meet Mei Mei and Micko, our new silky terrier neighbours. Dog Talk only appears in the print version of The Star. Oh, I didn't realize that cats had trouble synthesizing D! And here I thought our housebound cats sought out the sunny spots just for pleasure! I learn something new everyday! You're right and I had completely forgotten. But what a way to get your vitamins! Now I wonder how they know they need more D.
Heb jij nu twee katten Au & Target. Now I know just why cats love lying in the sunshine! Our kitties love climbing on the cars (and leaving their muddy little pawprints lol.) :) Happy Tuesday. That is great to have sunshine. We have a little sunshine but it is cold here in nothern Germany. Our cats tried to catch some warm sunbeams. Olli is a short hair cat with white fur. I think I ´ll give hime some lotion on his ears when it is spring and sunny here too. Our cats crave the sunny windows, good to know they are being healthy. When I was a kid my grandparents had a huge old-fashioned steam radiator in the kitchen, the cats loved to lie on it and never seemed to mind the burning heat. Cats seems to be a least as adoptable to our Planets different Climates as Homo Sapiens. Here, in Norway, we lack Vitamin D, but humans substitude with Cod Lever. We seek the Sun as soon as there are a Clear Sky. 10 minutes sunshine is all what's needed. The Cats eats fish. They understand how dangerous it is to walk around in the deep snow. Besides, there is nothing for them to hunt. But still, they are our best friends. Jumping into our beds at night. Waking us up in the Mornings. During Winter. Summer? When we live in our Summer house? Lovely Au ... sunshine is the best! That's so interesting about the vitamin D! Lovely pic of Au sunbathing. Cars get so nice and warm, too. what a perfect place for the cat/solar-panel to soak up the rays! Oh, I didnt know that. The Spice Cats hardly get any sun, that is not good for them. My cats love the sun too,they have a way of making thier bodies available (lol). What a handsome boy Au is! Cuteness! Cuteness! I'd love to give him a hug. Bet he smells good after a sun-worshipping session.